The best way to prepare for a test is to review frequently and consistently. Therefore, it's always a good idea to begin studying at least a few days before the exam. Whether your child is preparing for a standardized test or one for school, you can use the following tips to help him or her prepare. Your state's Department of Education likely provides practice standardized tests. 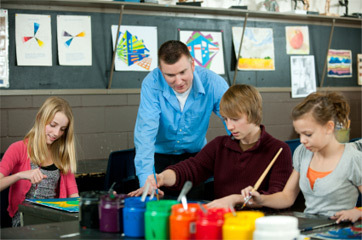 The topics on the English and language arts section may include vocabulary, writing techniques, reading comprehension and analysis. In the comprehension and analysis sections, your child can expect a reading passage followed by a series of multiple-choice questions. To test writing skills, your child may have to write an essay or answer multiple-choice questions regarding sentence structure and organization. There's no way to know exactly what will be on the test; however, to prepare, give your child a practice test to familiarize him with the time limit and the types of questions. You may also want to teach your child test-taking techniques, such as the process of elimination. Additionally, it's sometimes beneficial to read the questions first, so you'll know what to look for when you're reading the passage. In addition to standardized tests, your child will also take reading tests in class. These tests may be comprehension-based to make sure the students did the reading at home. There might also be an end-of-unit exam, which tests students on their analysis of the whole text. These kinds of tests will likely include short-answer and essay questions. To prepare, your 5th grader should reread her notes from class. Sometimes, teachers provide a study guide, which lists all the topics that will be on the test. If not, your child can make her own study guide. Begin by skimming the novel or text that the test will be on. Create a time line of the main events to review the plot. Also, be sure your 5th grader knows all of the character's names. Then, your child should list out the major themes of the story and explain why those are the themes. Just in case, he should have at least three examples from the text as evidence. Also, review the vocabulary words from the novel. In 5th grade, discussions about figurative language will likely be limited to metaphors and similes. Both compare an abstract concept to something concrete, like, 'Her eyes flashed like lightning' or 'This assignment is a monster.' Make sure your child understands what's being compared and why that comparison is being made.